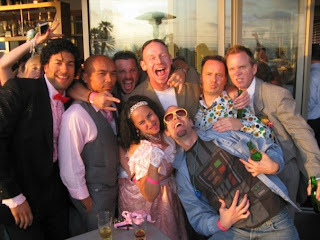 I had a blast at the 80's Prom Pub Crawl last night, riding a crowded limo bus to six bars all over San Diego. Earlier in the week, Chad and I went to Flashbacks with Anna to get the appropriate 80's outfits. Chad got a cool mullet wig as well. We started out at the bar in the Del Mar Plaza with a few drinks as everyone arrived. There was a great mix of 80's clothes, including old prom outfits pulled back out of the closet. I had never been in a limo bus before. Long rows of leather seats lined both sides with a stripper pole in the back. The bus was boiling hot in the beginning, but the A/C began to kick in as the journey began. After a champagne toast on the bus, we arrived at Jack's in La Jolla. We were all given ballots to vote for 80's Prom King, Queen, Princess, Princess, Duke, Duchess & Best Dressed. I made a concerted effort to campaign for Duke, offering bribes, some vote-trading and demonstrating my dance moves to win votes. I think I had it wrapped up by the time we left. There was a lot of cool cow statues out on the street. Street art is even better appreciated with a buzz. Our next stop was Tower 23 in Pacific Beach. It is right next to the beach and we arrived as the sun was setting. Very nice. I was having a beer and a shot of tequila at each stop and this is where the drinks really started to kick in. I think it was the same for others as well. On the ride down to Jbar in Downtown San Diego, the winners were announced. I won Duke so all my campaigning had paid off. The Prom Royal Court had our pictures taken together over by the pool on the rooftop bar. It got crazy and was real fun. Universal in Hillcrest was pretty empty when we arrived, but it was no problem for our large group. More room on the dance floor for us. I was really wasted at this point so it was a bit of a blur. The Pub Crawl had started out calm but got crazier and crazier as the night went on. Driving away, the bus was really rocking, everyone dancing and singing along to the loud 80's music. Our last stop for the night was Whiskey Girl back in Downtown San Diego. Of all the bars we visited, this is the only one I had been to before. We ended up downstairs in the Karaoke room. After 8 hours of drinking, I started to run out of gas a bit. Chad, Anna & I left at 12:30am after a great night. Today, I am suffering from a mean hangover, but it was worth it. I am so lucky to be living here in Encinitas. It is a beautiful day in Southern California. Today started with a delicious breakfast after the neighborhood meeting down at Le Papagayo Restaurant. My sister-in-law works there and the restaurant is trying to get its alcohol and live music permit extended to the new dining room in the back. Everyone seemed very positive about it. For my trip this fall, I also got my passport photo taken today for the Brazilian Visa Application. (Can't wait!) I took these pictures over at D Street while I was walking around Downtown Encinitas waiting for my Jeep Wrangler to pass its Smog Test. (It passed!) I am definitely going down to the beach tomorrow to surf and throw the Frisbee. Now, I am off with my best friend to see the band, Skanic, down at Fiesta del Sol in Solana Beach. The last time I saw them play was in Mexico at Cactus Stock. That was a great trip. UPDATE: It was good to hear the band again. On the drive back home, I took a picture of my favorite stretch of Coast Highway 101 as the sun was setting. The Pacific Ocean to the West and the San Elijo Lagoon to the East with the cliffs above Swami's in the distance. My nephew, Emery, who just turned two is obsessed with skateboarding. He always wants to copy Justin, my youngest brother. When I saw him skating with Justin in the driveway, I just had to take these pictures.